Golra Sharif is a town situated near the Margalla Hills, in the Islamabad Capital Territory, Pakistan, at about 520 m (1,710 ft) above sea level, 17 km (11 mi) from the ancient city of Taxila. 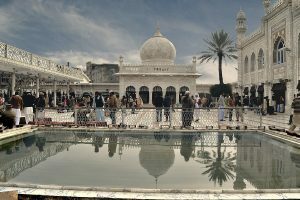 The Mausoleum of Meher Ali Shah, Golra Sharif has much significance for the people of the Pothohar Plateau and the yearly anniversary of the Pir Meher Ali Shah which is attended by thousands of people every year to pay their regards. Nowadays Golra Sharif is widely known for one of its custodians (Sajjada Nasheen) Pir Syed Naseer Uddin Naseer Gilani (R.A). At present this spiritual place's Custodian (Sajjada Nasheen) is Pir Syed Shah Abdul Haq Gilani.